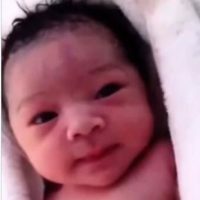 Miraz Full name: Mehedi Hasan Miraz. Place of Birth: Khulna, Bangladesh. Teams: Bangladesh National Cricket Team, Bangladesh Under 19, Kalabagan Cricket Academy. Major teams Bangladesh Under-19s, Kalabagan Cricket Academy. Playing Style: Batting: Right Hand, Bowling: Right arm offbreak. 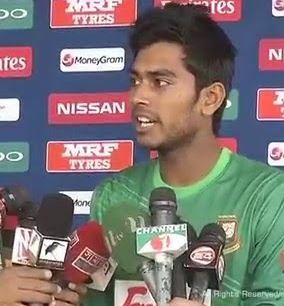 Miraz Test debut on 20 October, 2016, Bangladesh Vs England. Miraz hold the record 19 wicket haul in two test matches that were most wickets in a test series by a Bangladeshi cricketer. Bangladeshi Young cricketer Miraz is playing with Kalabaghan Cricket Academy and Khulna Divisition in addition of Bangladesh National Team. 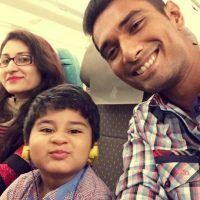 Mehedi Hazan Miraz was born in Barisal district and his family moved to Khulna when he was a child with his parents. He grew up in Khalishpur area of Khulna city. Miraz started playing cricket when he was 8 years old. He learn cricket from Kashipur Cricket Academy and selected for under 14 National cricket team. He learned offspin blowing from Sheikh Salahuddin, a former Bangladeshi player considered as the best offspinner during his time. Bangladeshi cricketer Salahuddin passed away in October 2013. Miraz is a all-rounder cricketer of Bangladesh who bowls right-arm offspin with a quiet action. His bowling action is beautiful and simple action that has yielded him many wickets in the U-19 tournament and first-class division. 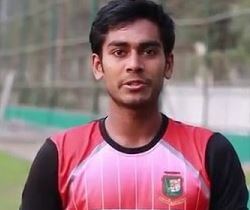 Miraz was selected captain of Bangladesh team for under 19 Cricket World Cup in 2016. Bangladesh team was qualified to play into semifinal and lost to West Indies. Bangladesh under 19 team beat Sri Lanka by 3 wickets and took 3rd place. 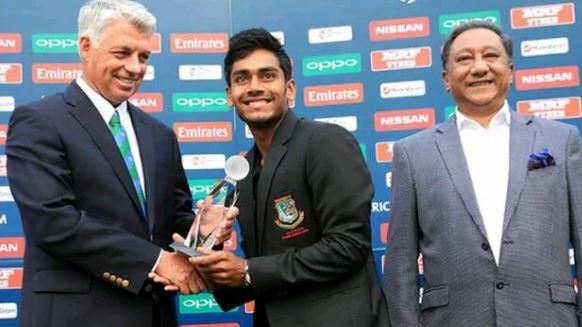 Mehedi Hasan Miraz was named Man of the Tournament for his all round performance. Miraz scored 242 runs & took 12 wickets in 6 matches. Miraz family is living in a tin shed house in Khalispur of Khulna with happiness. Recently, He brought so much glory to the country by beating strong counter part England in a test series. Prime Minister of Bangladesh Sheikh Hasina has taken steps to ensure comfort for living with his family. Prime Minister announce to build a brick build house for Miraz.